Every time we visit Puerto Rico I make sure to come back with one or more books for little one’s home library. We visited El Morro in Old San Juan, and their gift shop had quite a selection of children’s book. 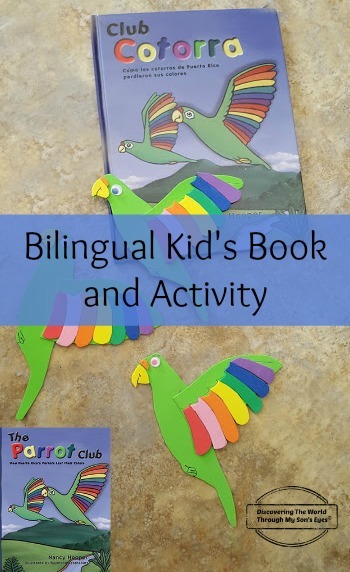 My child picked The Parrot Club / Club Cotorra by Nancy Hooper. This made me happy because if it was a book that caught his attention, it’s a book that he will read. It’s an English and Spanish edition in one book. Just like my son’s favorite book Everywhere Coquis!/¡En dondequiera coquies! and by the same author. Little one had his Spanish-speaking friends over for a playdate so I jumped on an impromptu Spanish story time, and activity for this book. The story is about the Puerto Rican parrots that had “beautiful” colored feathers, and sang beautifully. They admired themselves so much that they created their own very club: The Parrot Club. They boasted themselves amongst the animals on the island, bragging, and not allowing any animal to join their club. The animals were saddened but they all went about their own way, except for the fish in the ocean. They responded to the parrots that they’d have their own club too, and the parrots weren’t allowed. The parrots were not happy, and said they’d join the club and they all dove into the water! Their beautiful colored feathers were losing it’s color, and they couldn’t sing! They were saddened about not letting any other animal in their club. They began to accept their beautiful green color, and all of the animals of the island were part of the animal club. The beautiful Puerto Rican parrot is a bright green bird with a red forehead and wide, white eye rings. When the Spaniards colonized Puerto Rico it is estimated that the population of parrots was about a million. During subsequent centuries, 85% of the island suffered deforestation. The only large trees remaining for the parrots to nest in were found mostly in the Caribbean National Forest (El Yunque). The population of the parrots was greatly reduced until laws were passed prohibiting hunting of parrots in the forest. In 1968, the Puerto Rican parrot was put on the endangered species list, kicking off a collaborative effort by the U.S. Fish and Wildlife Service and the Puerto Rico Department of Natural Resources to rescue the species. In El Yunque there is a parrot aviary run by the federal Fish and Wildlife Service. Today the population of parrots in the forest is less than 50, but every year individual parrots and pairs raised in captivity are released, and the rate of survival of the species is on the rise. It wasn’t hard to make an activity to tie in with this book. 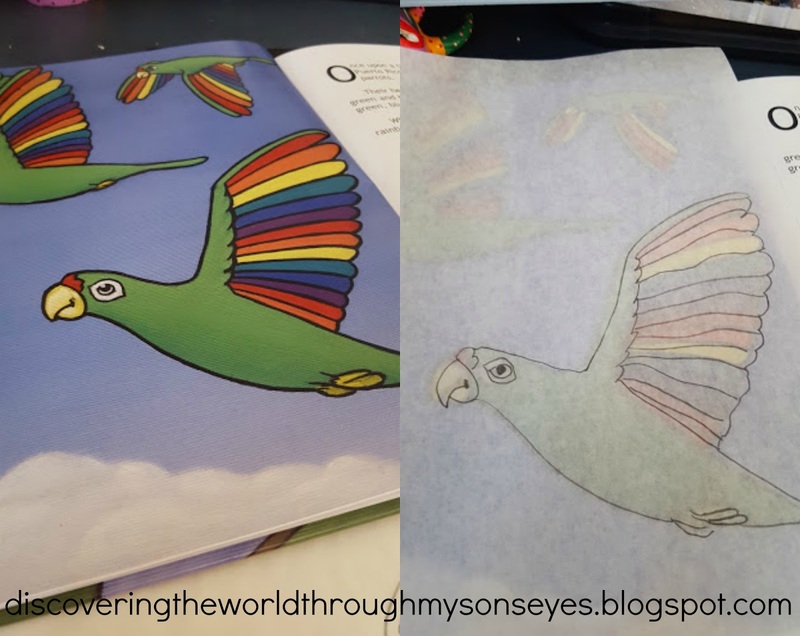 I traced the parrot from the book, and cut the shape out of craft foam. I cut-out different color of foams for the wings, and numbered them (so it would be easy for him to glue) as well as the beak. I cut long strips of magnetic sheet, and found some googly eyes; and glue sticks. 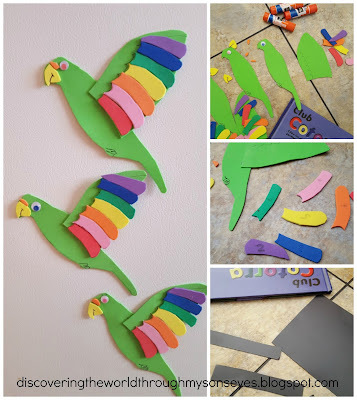 The fun part was having my son and friends glue the parts together to make the parrot. They glued a strip of the magnetic sheet, and proudly displayed them on the refrigerator. For more multicultural, and/or bilingual children’s book click here. Hello Joana!! I'm excited for you! 🙂 This book is definitely a favorite in our home. Hope you're able to find some good books while you're in Puerto Rico. Thanks for stopping by. I think next time you go to PR I'm going to wire you some cash so you can bring me back some goodies too! 😉 I love all the books you have featured from your trips there. 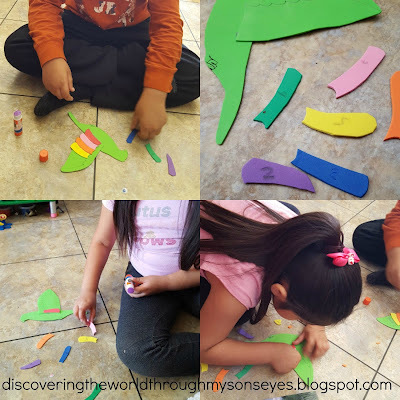 And this activity is great!